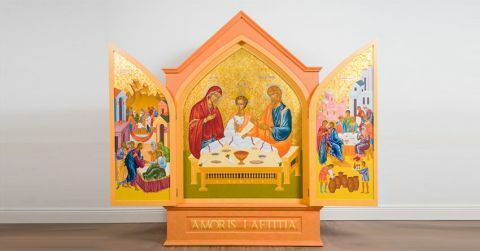 The Official Icon of the World Meeting of Families will be in the diocese from Monday 5 March - Thursday 15 March. It is hoped that as many people as possible will go along to the venue in their deanery area or of course, to any of the four venues. There will be a Petitions Box in the various venues while the Icon is there. The petitions will be forwarded to a convent of contemplative nuns who will pray for all the intentions prior to WMOF2018. Derry City : St Eugene's Cathedral, from 12:30pm on Wednesday 7 - 11.00am on Monday 12 March. Bishop Donal McKeown will lead Night Prayer on Wednesday 7th March at 8:30pm. Bellaghy : St Mary's Church, Tuesday 13 - Thursday 15 March. Petitions Box – There will be a Petitions Box in each venue while the Icon is there. We are brothers and sisters in Jesus your Son,One family, in the Spirit of your love. Make us patient and kind, gentle and generous, welcoming to those in need.